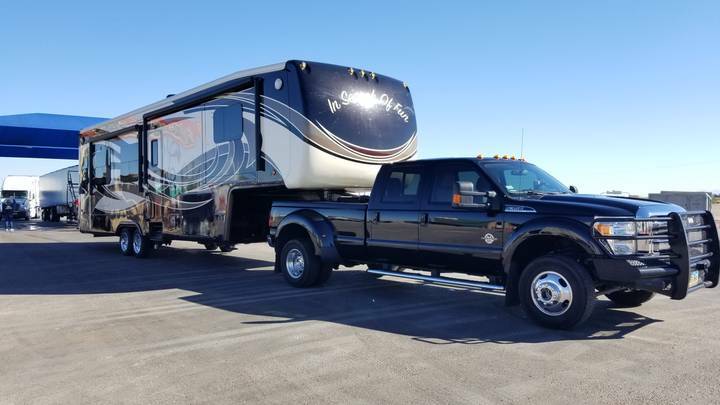 2016 Ford F350 DRW Diesel also for sale, or buy with trailer: $126,000 for both. Possible interest in trading (plus cash) for a smaller travel trailer (e.g. 24′), especially an Airstream Safari vintage. Interested in RV park hosting? This is our 3rd year winter hosting at Twin Palms RV Park in Mesa Arizona, but we’re giving it up April 1. It has been a fantastic location and hosting like no other. Twin Palms is a small 15 site park with several month-to-month folks, so not a lot of RVs come and go. The owner also has a small motorcycle shop in front of the park and handles all the reservations and $ there. Depending on pending movement, and cleaning the very clean restrooms once a week, the hosts are pretty much on their own schedule. A very nice small park that many people like. Owner is very appreciative of any extra effort given to make the Park better. Check the web page. Buy our trailer and perhaps host here too. If interested, send me an email (see info above) with your information and some pictures and we’ll email you more information.